How to add farmhouse charm to your kitchen today! Welcome friends! 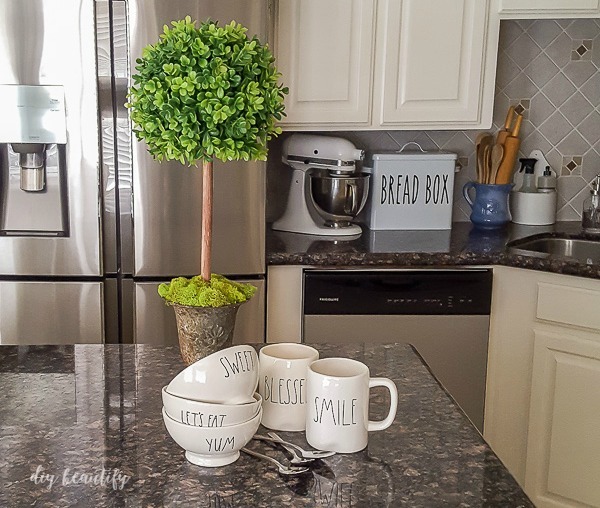 Today I'd love to share some of the changes we've made to our kitchen to add farmhouse style and charm as well as my top 5 tips for getting the farmhouse look for less! I'm a cheapo, so the majority of my changes/updates have been incredibly budget-friendly and I can't wait to share these with you. 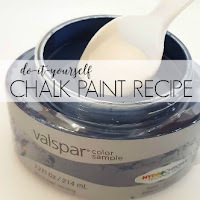 One of the most affordable ways to transform a space is with a fresh coat of paint! Today's modern farmhouse kitchens are gray, blue and white. 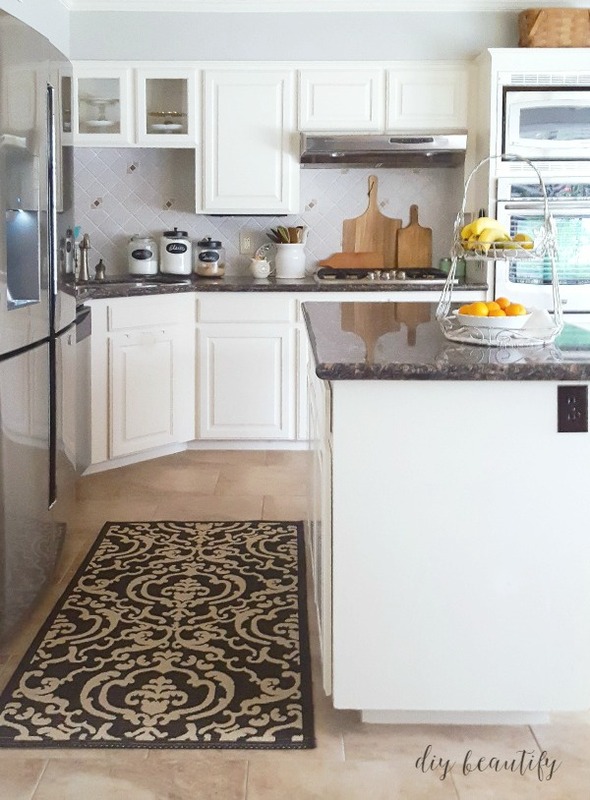 I went back into the archives and found a few before pictures of my kitchen to share with you. 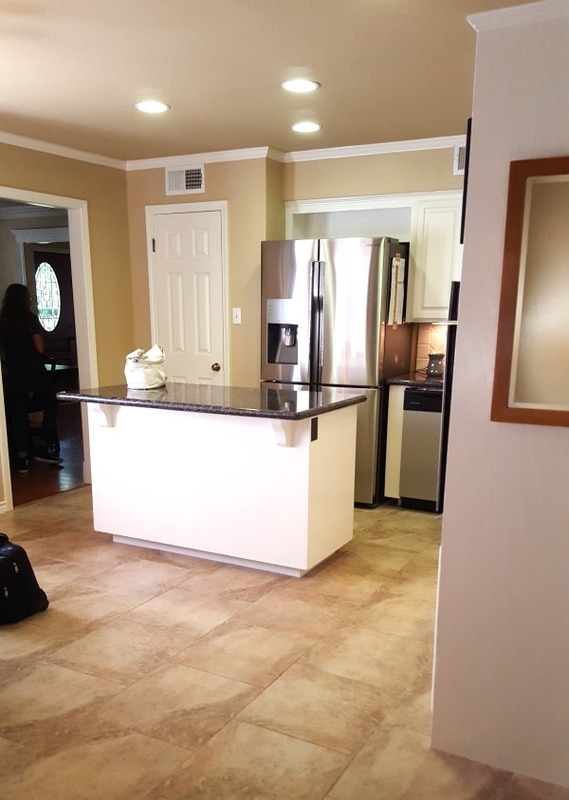 While the kitchen has great bones and had been updated with painted cabinets, marble counters and tile floors, it was soo dark! The wall color made the space feel gloomy, while the paint on the ceiling made the kitchen feel even smaller. 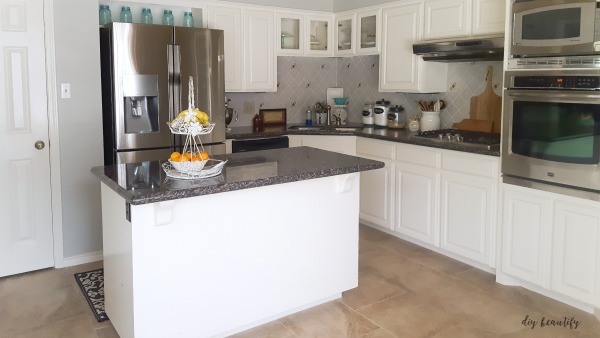 I lightened and brightened our kitchen with a fresh coat of light gray paint. 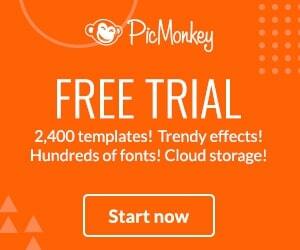 Instant gratification! I tackled the oak cabinet next. It was so dark and really stuck out like a sore thumb in this small kitchen. By painting it the same color as the walls, it recedes. And let's face it, that oak grain was doing nothing to say 'farmhouse'! 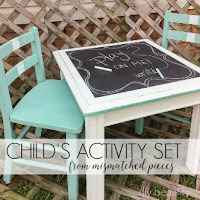 You can read details about how I painted the cabinet here. The ceiling was given a fresh coat of white paint as well, which made the small kitchen feel more open and airy. It also draws the eye up, away from the sand-colored tile which wasn't in the budget to change! You probably already know that I'm a sign-lover! Signs are hot right now, and add a fun dose of farmhouse charm to a kitchen. 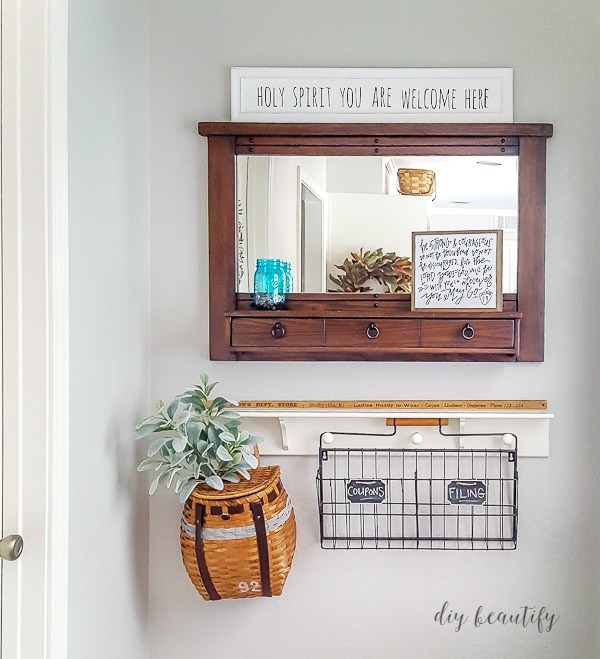 You can repurpose an old sign with a new saying for a super-budget-friendly project. Or add a pop of color with a sign. 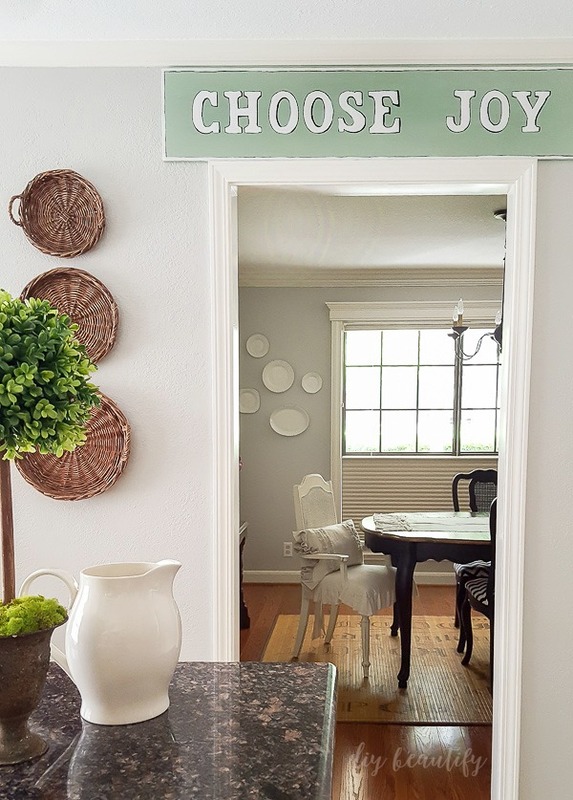 I made the 'choose joy' sign in my pre-blogger days so I don't have a tutorial but it's similar to this one. Any old board will work! 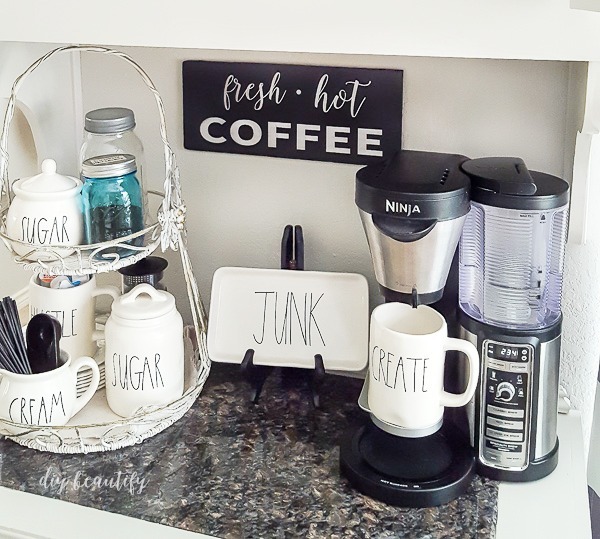 Another budget DIY sign, the 'fresh hot coffee' sign was made out of white poster board and craft vinyl! If you'd like a tutorial, please let me know in the comments and I'd be happy to share one. But you don't have to make your own or visit Round Top to find a great sign for your farmhouse kitchen! There are lots of affordable options available here. 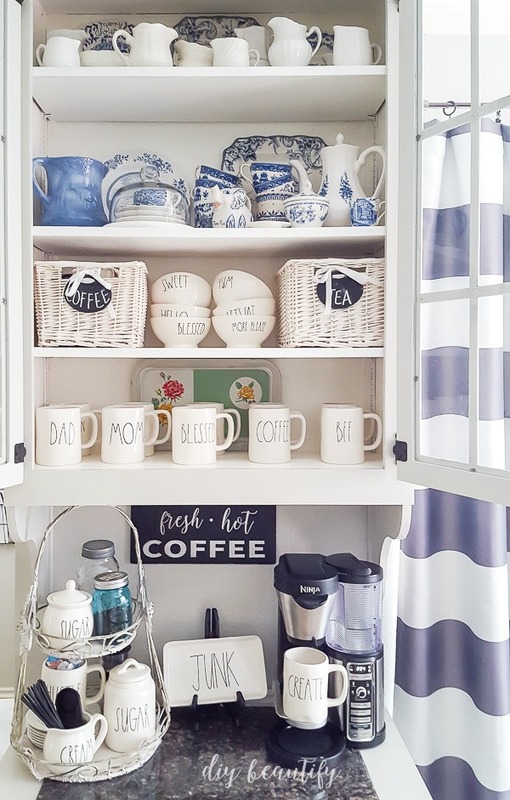 A dedicated place to make coffee and keep all your favorite mugs and coffee stuff is charming and a great way to show off a collection! You can use a hutch like I did; but a corner on your counter would work too. My painted cabinet is stuffed to the brim with items I've been collecting for years! The top two shelves are filled with my small white ironstone creamers and pitchers as well as blue and white transfer-ware and other blue and white items I've collected. 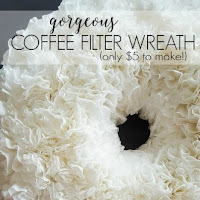 Everything was found at thrift stores and cost very little, including the white tiered basket that I'm storing coffee supplies on! Want to start collecting white pitchers to add farmhouse appeal in your kitchen? Check these out or just keep your eye open the next time you're at the thrift store! My newest craze is Rae Dunn...that's the creamy pottery with the large black words. It's difficult to find, but I've gotten lucky (with the help of some great friends), and my collection has grown quite a bit! It's very affordable in stores if you're lucky enough to find some. 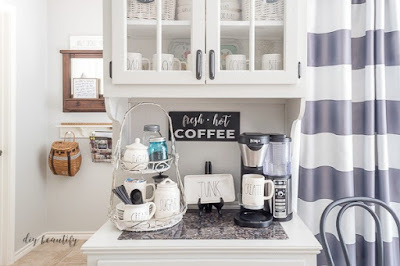 You don't need to be a collector to have a great coffee bar! 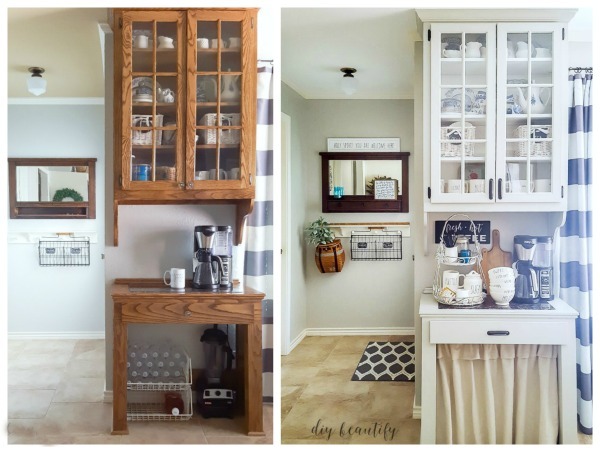 Just add a tiered stand or mug tree near your coffee maker. Stock it with all the items that you (or a guest) need and now your coffee necessities are both functional and decorative! Adding modern farmhouse appeal to a kitchen and home is all about texture! BASKETS and WOOD - anything with a natural material (hang baskets on the wall, stack thrift store picnic baskets, bring in seagrass chargers, hang a fishing creel for storage, an old stool with chippy paint). A collection of thrifted wooden spoons or rolling pins in a large crock is perfect! The older the better in this case because the patina on older pieces adds an authentic farmhouse feel, even to a more modern space! 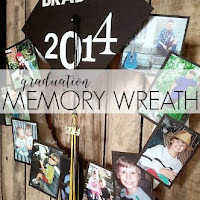 WREATHS - add a wreath or two to your kitchen. 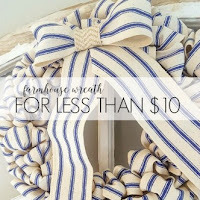 Here is a tutorial for an easy DIY wreath that you can make in about 30 minutes for less than $10...it's one of my most popular wreaths and is all farmhouse! 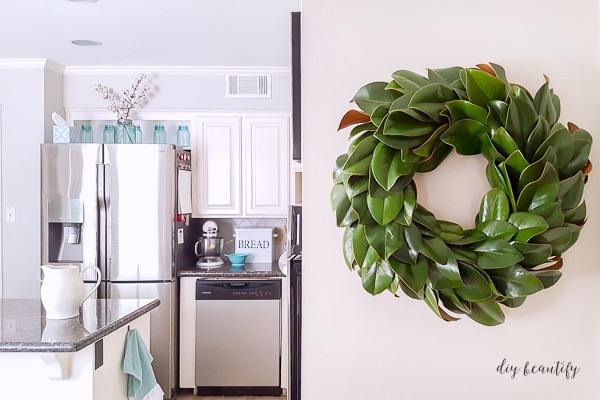 Or hang a natural wreath like magnolia, cotton, or boxwood, all popular options! Learn how to make your own magnolia wreath here. Magnolia wreaths are pricey, but mine cost $0!! 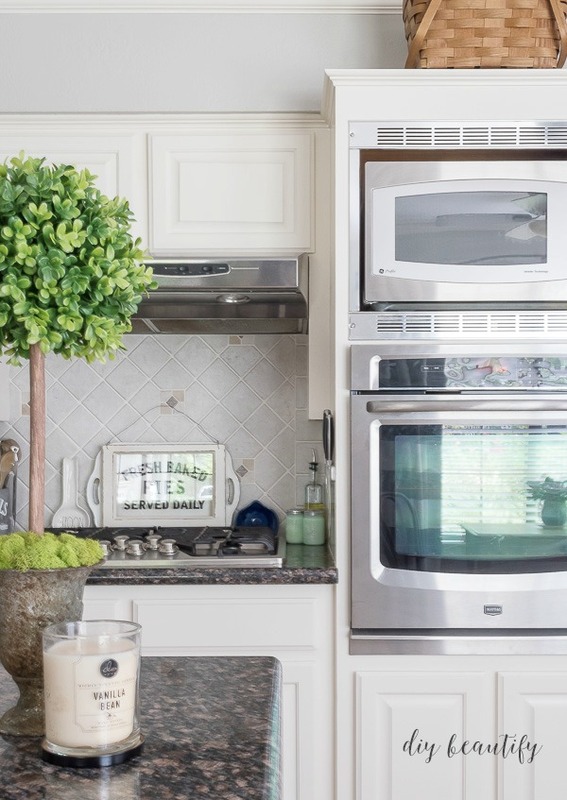 PLANTS - olive trees and fiddle leaf figs are popular for home decor! Greenery doesn't need to be live to add a fresh feel. Make a topiary for your island, or even tuck some faux lambs ears or lavender in a mason jar or basket for some soft farmhouse color! FABRIC - think nubby fabrics like burlap, stripes like ticking or canvas drop cloth. 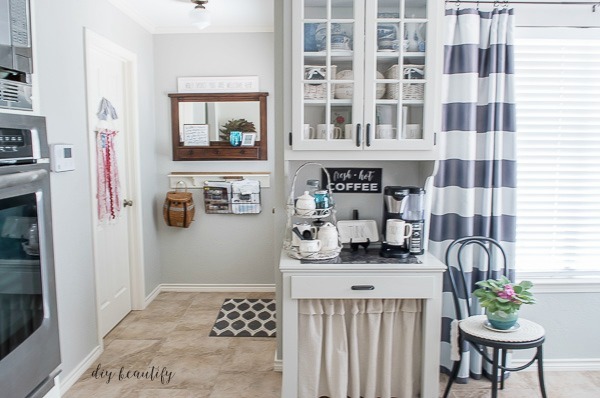 I used a piece of drop cloth to sew a quick skirt for my coffee bar. 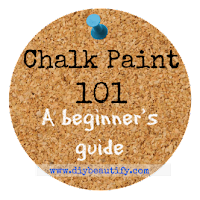 Burlap and drop cloth are as budget-friendly as it gets! 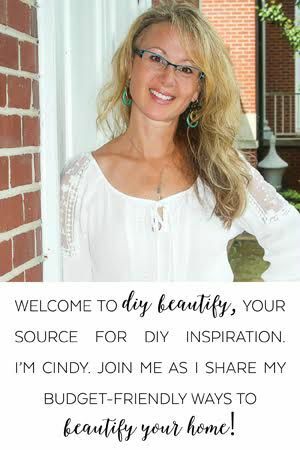 Find out how I made easy, no-sew chair pads for my breakfast nook! Neutral patterns on curtains are great choices too, like these wide-stripe blackout curtains from Lush Decor. I think the wide stripes and bold pattern keep it from feeling like 80's country (remember country blue and ducks?) 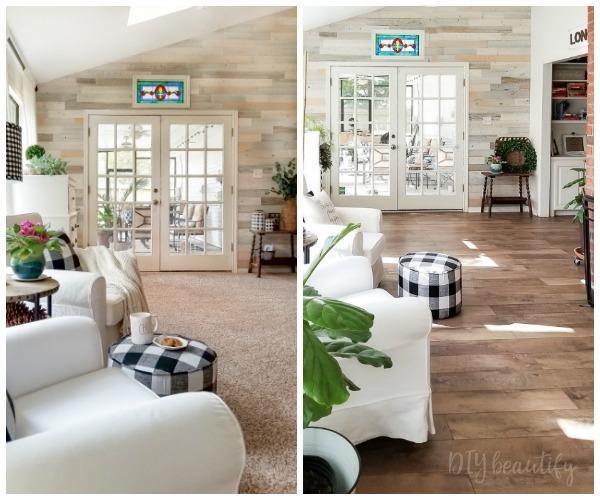 and adds a modern farmhouse feel! 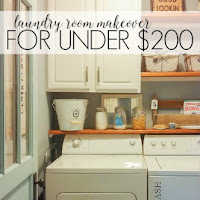 It's easy to add texture to your farmhouse kitchen and keep it under budget! You probably have several items you can use right now! 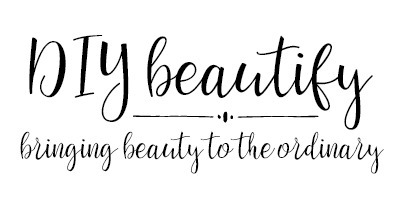 Great finds, affordable ones, are out there...you just need to be willing to go out and look for them! I've found some of my very favorite decorative items at thrift stores. 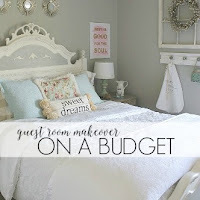 I love HomeGoods and Marshalls for affordable farmhouse finds too! We cannot forget World Market, Target, Kirklands and even Walmart and Hobby Lobby! Big box stores are definitely getting the hint that we want more farmhouse decor! 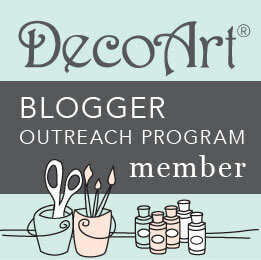 If you prefer online shopping, I recommend Decor Steals, Antique Farmhouse and Joss and Main. Their items for sale change daily. You can sign up so you are notified each day with that days steals or you can just check in periodically. Shipping is usually minimal. 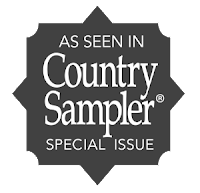 Another great source for affordable farmhouse finds is Amazon! I've been very impressed with the vast array of farmhouse items. If you're not squeamish, definitely check out what your neighbors are putting at their curbs on garbage day! I've found furniture, wood (perfect for DIY signs), terracotta pots and more at the curb! I hope these tips are helpful for you as you seek to bring farmhouse charm and style to your kitchen! What's your favorite budget tip for adding farmhouse charm?